This rather sums up what a nonsense our energy policy has become. It is frankly shocking that steel producers, and presumably other energy intensive industries, have been paying twice the price for electricity than competitors in France and Germany. Of course, it must be pointed out that in Germany it is domestic users who end up paying the bill. Claire Perry’s comment about exemptions from the costs of the Contracts for Difference scheme does not frankly add up to much. CfDs only account for 15% of green levies, so steel producers will still need to pay for the other 85%. As for £315m being thrown at decarbonisation projects. it is not clear how this will save industry any money at all. More likely it will add to costs unnecessarily. Meanwhile, it is other electricity users and taxpayers in general who will end up paying for relief packages and exemptions. Being “committed to minimising energy costs” is one thing. 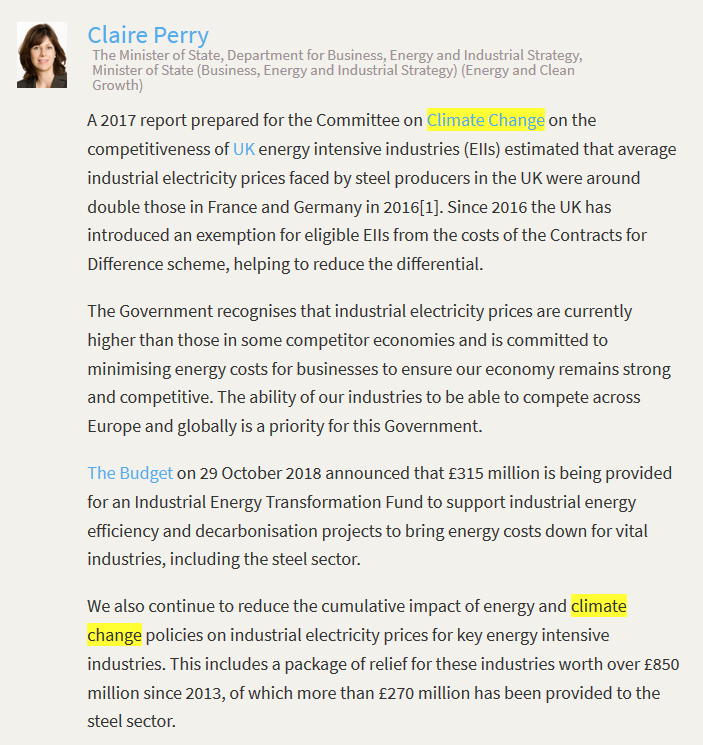 Actually doing something about it is another, which seems to be beyond Claire Perry’s ability. Would it not have been easier to put a stop to obscene green subsidies in the first place? ← Bernie Silent About Private Jets!